Java EE 6 introduced Contexts and Dependency Injections (CDI) as a set of component management services that allow for loose coupling of components across layers (through dependency injection) in a type-safe way. The benefits of CDI include a simplified architecture and more reusable code. 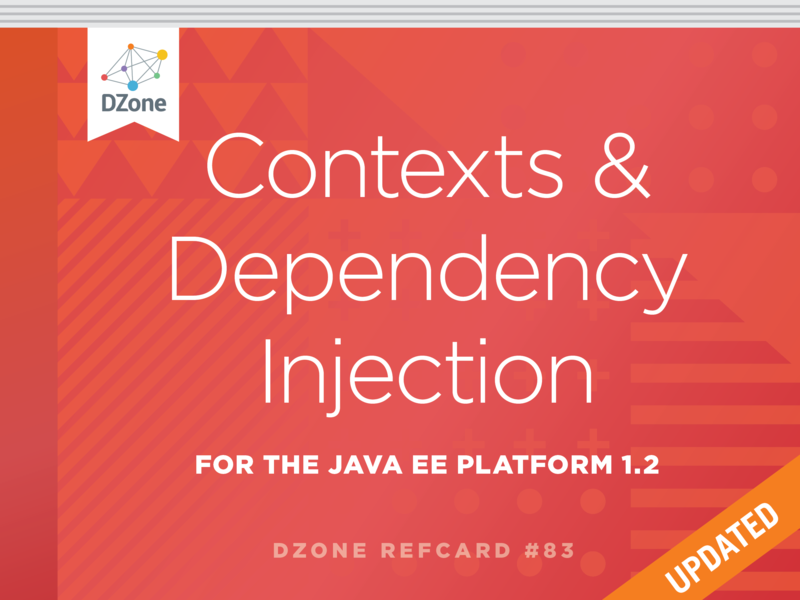 In this newly updated Refcard, you will learn about the main features of CDI 1.2 in Java EE 7, how to get the most from CDI, and how to get your CDI code up and running. Norman Richards Developer, ThreatGRID, Inc.
Contexts and Dependency Injection for the Java EE Platform (CDI) introduces a standard set of component management services to the Java EE platform. CDI manages the lifecycle and interactions of stateful components bound to well-defined contexts. CDI provides typesafe dependency injection between components. CDI provides interceptors and decorators to extend the behavior of components, an event model for loosely coupled components, and an SPI allowing portable extensions to integrate cleanly with the Java EE environment. CDI is included in Java EE since Java EE 6 (CDI 1.0). The EE 6 platform was designed to make sure all EE components make use of CDI services, putting CDI directly at the heart of the platform, welding together the various EE technologies. In Java EE 7 (and CDI 1.2) this integration goes further with the automatic enablement of CDI in the platform and more integration with other specs. This document covers the main features of CDI 1.2, included in all Java EE 7 application servers. The easiest way to start writing and running CDI code is to write a Java EE 7 application and deploy it on your favorite server. (WildlFly is a good choice if you don’t have any). In Java EE 7, CDI is activated automatically: you don’t need to add anything to your application to have CDI ready in it. When your app is launched, CDI will scan your application to find its components (i.e. managed beans); this mechanism is called bean discovery. Keep in mind that there is no global configuration for bean discovery, it is set only for the current bean archive. Managed beans and session beans can be excluded from the discovered beans by adding the @Vetoed annotation on their defining class or package. It can also be done in the beans.xml file as explained in the spec. 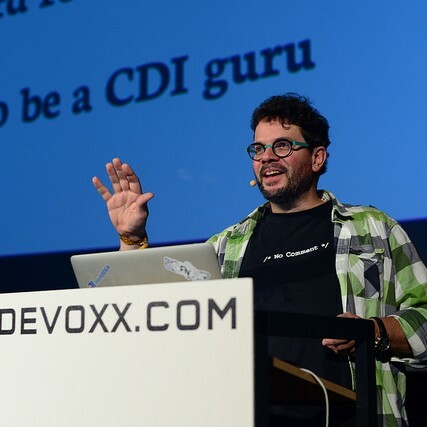 The container is the heart of CDI: you can think of it as the invisible conductor of your application. It checks all possible CDI code at boot time, so exceptions at runtime are very rare in CDI--you know that something is wrong in your code at launch. The container manages your components' lifecycle and services. It’ll create class instances for you when needed and add CDI features on the provided object. This enriched object will be automatically destroyed when the scope it is bound to is destroyed. That’s why you’ll never use the “new” operator on a bean class unless you want to forego all CDI features on the resulting instance. CDI, at the most basic level, revolves around the notion of beans. The container discovers them at startup time by scanning classes in the deployment. A bean is defined by a set of attributes obtained by reading annotations and type on the bean definition. As we said above, the CDI container is in charge of creating and destroying bean instances according to their context, hence the term contextual instance. The table below introduces these attributes--they’ll be detailed later in this Refcard. The set of Java types that the bean provides. This set is used when performing typesafe resolution (find the candidate bean for an injection point). Developer-defined annotations . p rovide a typesafe way to distinguish between multiple beans sharing the same type. They are also used by the typesafe resolution mechanism. Also known as “context”. Determines the lifecycle and visibility of a bean. The container uses this attribute to know when to create and destroy a bean instance. A bean can be defined as an alternative for an other bean. This feature can be used to simplify test creation, for instance. This optional value, is the only way to resolve a bean in a non typesafe way (i.e. with a String identifier). It allows bean access from the UI layer (JSF or JSP) or when integrating a legacy framework with CDI. In a lot of blog posts and documentation, the term Bean is often used instead of contextual instance. It’s important to understand the difference. A bean is a collection of metadata associated with some code (usually a class) used by the container to provide a contextual instance. A contextual instance is the object that the container creates from the Bean attributes when an injection point has to be satisfied. In short, unless you’re developing an advanced CDI feature, your code will only deal with contextual instances at runtime. As we just said, contextual instances are created and managed by the CDI container. When creating such an instance, the container may perform injection of other instances in it if it has one or more injection point. Keep in mind that injection occurs only when the instance is created by the container. When a field is annotated with @Inject, the container will look for a bean with a matching type and will provide a contextual instance of this bean to set the field value. Only one constructor in a bean class may be annotated with @Inject. All parameters of the constructor will be resolved by the container to invoke it. A bean class can one or more methods annotated with @Inject. These methods are called initializer methods. See below for their usage. CDI provides different ways to define Beans. The type set of the bean will vary with its kind. If needed, using the @Typed annotation on bean definition can further restrict this type set. Object will always be part of bean type set. CDI is not affected by type erasure, so List and List will correctly be treated as two different types. Managed beans are the most obvious kind of bean available in CDI. They are defined by a class declaration in a bean archive. It is a concrete class, or is annotated with @Decorator. The class declares a constructor annotated with @Inject. Local stateless, singleton, or stateful EJBs are automatically treated as CDI session beans: they support injection, CDI scope, interception, decoration, and all other CDI services. Remote EJB and MDB types cannot be used as CDI beans. When using EJB in CDI, you have the features of both specifications. You can for instance have asynchronous behavior and observer features in one bean. A stateful bean (with no-interface view) defined in @ConversationScoped scope. It has ShoppingCart and Object in its bean types. A stateless bean in @Dependent scope with a view. Usable in EL with name “loginAction”. It has LoginAction in its bean types. It’s javax.ejb.Singleton defining a singleton session bean. The EJB will be instantiated at startup triggering instantiation of MyBean CDI bean. Producers are the way to transform classes you don’t own into CDI beans. By adding the @Produces annotation to a field or a non void method of a bean, you declare a new producer and so a new Bean. Fields or methods defining a producer may have any modifier--even static. Parameters in producer methods become injection points, and are resolved by the container before invocation. Producers are also used to defined Java EE resources (like Persistence Context or Resource) as a CDI bean. If it’s a class, the set will contains the class, every superclass, and all interfaces it implements (directly or indirectly). This producer method defines an EntityManager with @UserDatabase qualifier in @RequestScoped from an EntityManagerFactory bean produced elsewhere. Sometimes an injection point has more than one bean candidate for injection. When bean type is not enough to resolve a bean, we can create a qualifier and add it to a bean. Because qualifiers are annotations, you maintain the benefits of the CDI strong typing approach. Qualifiers are used on bean definitions or injection points. To match a given bean, an injection point must have a non-empty subset of the bean qualifiers (and of course a type present in its typeset. @Nonbinding annotations can be applied to a qualifier member to exclude it from the qualifier resolution. The CDI container will treat two instances of MyQualifier with different comment() values as the same qualifier. When resolving beans for a given injection point, the container considers the set of types and qualifiers of all available beans to find the right candidate. Sometimes it is useful to resolve a bean at runtime or find all beans that match a given type. Programmatic lookup brings this powerful feature thanks to the Instance interface. As instance extends the Iterable interface, you can use it to loop on instances of all beans of the specified type and qualifiers. Finally, programmatic lookup helps you to select a bean by its type and qualifier. The CDI spec provides the AnnotationLiteral and TypeLiteral classes to help you create instances of an annotation or parameterized type. The CDI.current() static method returns a CDI object that extends Instance. As all beans have Object in their type set, it allows you to perform a programmatic lookup on your entire beans collection. CDI can also return the BeanManager--a class giving you access to advanced CDI features, including bean resolution. For backwards compatibility, the BeanManager is also accessible through JNDI with the name java:comp/BeanManager. You can learn more on BeanManager in the spec. Events provide a mechanism for loosely coupled communication between components. An event consists of an event type, which may be any Java object, and optional event qualifiers. Events are managed through instances of javax.enterprise.event.Event. Event objects are injected based on the event type. Events are fired by calling fire() with an instance of the event type to be passed to observers. Observers listen for events with observer methods. An observer methods should be defined in a bean, and must have one of its parameters annotated with @javax.enterprise.event.Observes--the annotated parameter defines the type to be observed. Additional parameters to an observer method are normal CDI injection points. If a contextual instance of a bean with an observer method doesn’t exist when the corresponding event is fired, the container will create a new instance to handle the event. This behavior is controllable using the receive value of @Observes. IF_EXISTS The observer method is only called if an instance of the component already exists. ALWAYS The observer method is always called. If an instance doesn’t exist, one will be created. This is the default value. Event observers are normally processed when the event is fired. For transactional methods, however, it is often desirable for the event to fire at a certain point in the transaction lifecycle, such as after the transaction completes. This is specified with the during value of @Observes. If a transaction phase is specified but no transaction is active, the event is fired immediately. IN_PROGRESS The event is called when it is fired, without regard to the transaction phase. This is the default value. BEFORE_COMPLETION The event is called during the before completion phase of the transaction. AFTER_COMPLETION The event is called during the after completion phase of the transaction. AFTER_FAILURE The event is called during the after completion phase of the transaction, but only when the transaction fails. AFTER_SUCCESS The event is called during the after completion phase of the transaction, but only when the transaction completes successfully. CDI supports two mechanisms for dynamically adding or modifying the behavior of beans: interceptors and decorators. Interceptors provide a mechanism for implementing functionality across multiple beans, and bean methods, that is orthogonal to the core function of those beans. It is often used for non-business features like logging or security. For instance, in Java EE 7 the JTA specification provides the @Transactional interceptor to control transactions for the current invocation. An interceptor binding is an annotation annotated with the @javax.interceptor.InterceptorBinding meta-annotation. Its goal is to bind the interceptor code to the bean or method to intercept. An interceptor is a bean declared with the @javax.interceptor.Interceptor annotation. Its matching interceptor binding should also be added to its declaration. Since CDI 1.1, the interceptor can be enabled with @javax.annotation.Priority annotation--this defines its resolution order. Method interceptors should have a method annotated @javax.interceptor.AroundInvoke that takes the javax.interceptor.InvocationContext as a parameter. The @Priority annotation to enable and prioritize the interceptor. Thanks to interceptor binding it is very easy to apply an interceptor to bean or method. When applied on a bean, all the bean’s methods will be intercepted. In Java EE 7 the easiest way to activate an interceptor in to use the @Priority annotation. It is also possible to do it in beans.xml file as explained in the spec. Decorators also dynamically extend beans but with a slightly different mechanism than interceptors. Where interceptors deliver functionality orthogonal to potentially many beans, decorators extend the functionality of a single bean-type with functionality that is specific to that type. Decorators are an easy way to change the business operation of an existing bean. A decorator is a bean annotated with @javax.decorator.Decorator. A decorator only decorates the interfaces that it implements (i.e. to be decorated a bean must implement an interface). The decorated bean is injected with the specific @Delegate annotation. A decorator must declare a single delegate injection point annotated @javax.decorator.Delegate. The delegate injection point is the bean to be decorated. Any calls to the delegate object that correspond to a decorated type will be called on the decorator, which may in turn invoke the method directly on the delegate object. The decorator bean does not need to implement all methods of the decorated types and may be abstract. In Java EE 7 the easiest way to activate a decorator in to use the @Priority annotation. It is also possible to activate a decorator in beans.xml, as explained in the spec. Decorators are always called after interceptors. This document is only an introduction to CDI--many topics are not covered here. To go further, you can go to the learn section of the CDI specification website where a lot of resources are available to go deeper in CDI learning. Developer-defined annotations. provide a typesafe way to distinguish between multiple beans sharing the same type. They are also used by the typesafe resolution mechanism.